January 5th is Considered Divorce Day in the U.S.
On January 5, 1643, Anne Clarke of the Massachusetts Bay Colony was granted a divorce from her husband, Denis Clarke, by the Quarter Court of Boston, Massachusetts. Mr. Clarke admitted to deserting his wife and their two children and to fathering two more children with another woman. More importantly though, Mr. Clarke refused to return to his wife, which gave the court the right to not only grant his wife a divorce, but also to punish him criminally, as was the custom at the time. According to most historians, the Clarkes' divorce was not the first U.S. divorce. Rather, it was the Massachusetts divorce granted to Mrs. James Luxford on December 3, 1639 on the grounds of bigamy appears to be the very first recorded divorce in the U.S. In addition to granting the divorce to the wife, the court issued a criminal punishment to the husband, which consisted of a fine, an hour in the stocks, and exile to England. The number of people filing for divorce drops to an annual low between Thanksgiving and Christmas. The holidays are the time of year when people are most willing to put aside differences and focus on family, and no one wants to be seen as the one who wrecked Christmas by calling it quits during the holidays. However, beginning in January divorce attorneys and online divorce form providers see a dramatic spike in people getting serious about divorce. New Year's resolutions involve wanting to make changes for the better and for people in unhealthy relationships, that often means deciding to get out. Not surprisingly then, January has become known as "Divorce Month." More information on preparing for divorce in the new year is available here. When it comes to filing your income taxes, your marital status on December 31st is your marital status for the entire year. In other words, waiting until the New Year to file for divorce allows spouses who prefer to file jointly to do so for the previous year's taxes. Additionally, plenty of Americans wait until after the New Year to file for divorce so that they are able to use their tax refunds toward divorce-related expenses like attorney fees or do-it-yourself divorce products and divorce filing fees charged by the court clerk's office when the case is filed. Is January Really "Divorce Month"...or Is It Actually March? However, data suggest that while more people begin contemplating and taking active steps toward divorce in January than any other month, March is the month that sees most actual divorce filings than any other month of the year. By analyzing online data, it's possible to determine the months that people most frequently search the internet for divorce-related terms. The data shows the upsurge begins in January and continues through March. 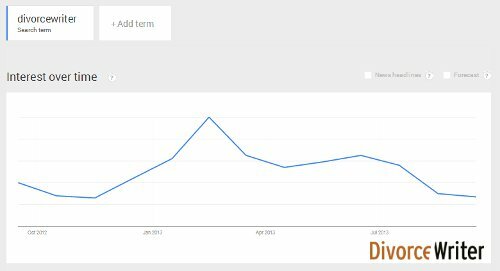 Supporting the case for March being the true American Divorce Month, DivorceWriter has also determined that people searching for the term "DivorceWriter" in Google gains popularity in January, but peaks in late February through March (see chart above). Given the emotional and financial consequences of divorce, it's really no surprise that people considering it take a couple of months, primarily January and February, as a divorce planning period, but actually pull the trigger by filing in March. In 2016, a University of Washington study found that, like March, August also sees a spike in divorce filings. Just as people wait to get through the winter holiday before filing, a similar sentiment exists during the summer. Filing after the annual summer vacation, but before children return to school, make sense. The family gets one last hurrah, but the transition can happen before the stress of the new school year begins. Besides a larger number of people doing searches for divorce in February and March, DivorceWriter's data also shows a smaller uptick in July and August. Whatever month you decide to file for divorce, you have to be realistic about your circumstances. To do this, you need to do your homework. This means getting a clear picture of what you have, what you owe and what you can afford after you split up. This will help complete your documents whether your lawyer's secretary prepares them or whether you do them yourself. If you choose to represent yourself without a lawyer, you'll need to find reliable documents and instructions for your state. If your state requires a court hearing to finalize the divorce, familiarize yourself with what happens at a typical divorce hearing. December 3, 1639: The very first divorce is granted in the U.S. in Suffolk County, Massachusetts. January 1, 1970: California becomes the first state to offer a no-fault divorce option. The governor at the time, future President Ronald Reagan, would later call his decision to sign California's no-fault bill into law one of the biggest mistakes of his political career. Reagan was also the first divorced president in U.S. history. He and actress Jane Wyman divorced in 1943. August 22, 2014: Florida couple, Keith Hinson and Michelle Knight, became the first couple to take a divorce selfie.